4 for Texas is a 1963 American western comedy film starring Frank Sinatra, Dean Martin, Anita Ekberg, Ursula Andress, and featuring screen thugs Charles Bronson and Mike Mazurki, with a cameo appearance by Arthur Godfrey and the Three Stooges (Larry Fine, Moe Howard and Curly Joe DeRita). The film was written by Teddi Sherman and Robert Aldrich, who also directed. Later, in Galveston, Thomas and Jarrett become rivals in a bid to open a waterfront casino. Each has a new romantic attachment as well, with the beauties Elya (Anita Ekberg) and Maxine (Ursula Andress), respectively. They eventually must join forces to hold off the villainous Matson and a corrupt banker, Burden (Victor Buono), to keep their new gambling boat afloat. The film was announced in 1960 as Two for Texas. The role of Elya was originally intended for Sophia Loren who had already worked with Sinatra in The Pride and the Passion. Although she was offered $1,000,000 for four weeks of work, Loren turned the part down. 4 for Texas was filmed in 1.85:1 aspect ratio on 35-millimeter Technicolor film. Its promotional trailer features Ursula Andress in specially shot footage addressing the audience. The film had its U.S. premiere on December 18, 1963. 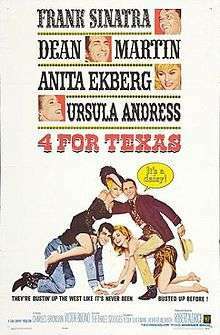 Forty-three years after its original premiere, 4 for Texas was presented at the Turin Film Festival on November 12, 2006. Its first DVD release arrived on November 20, 2001 and the second release (as part of The Rat Pack collection of Ocean's 11 and Robin and the 7 Hoods) was on June 13, 2006. It was nominated for the Golden Laurel as "Top Action Drama", ultimately coming in fourth. ↑ Kaplan, James. 2015. Sinatra: The Chairman. New York: Doubleday. p. 597. ISBN 9780385535397.